Once a midrange series in the Samsung’s smartphones line-up, the Galaxy A-series has undergone a makeover in 2019 and the new range covers both budget and midrange phones. Leading the charge is Samsung Galaxy A50, which seems to have been built taking cues from the premium S-series and budget M-series. 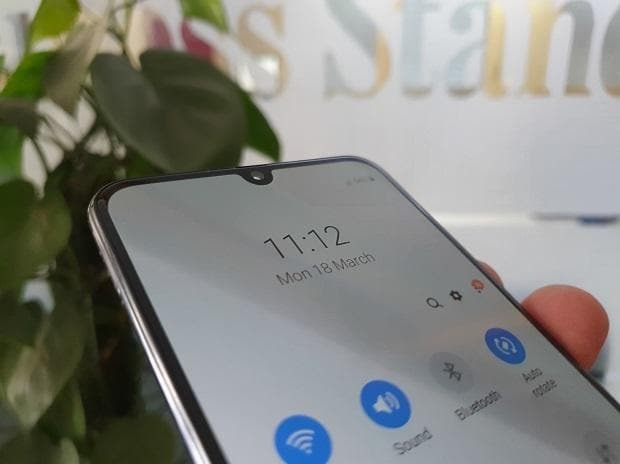 The Galaxy A50 is Samsung’s first mid-range offering to boast an in-display fingerprint sensor and U-shaped notch screen. The phone also has a triple camera module and gradient reflective design on the back, making it a feature-rich proposition in the entry-level midrange segment. 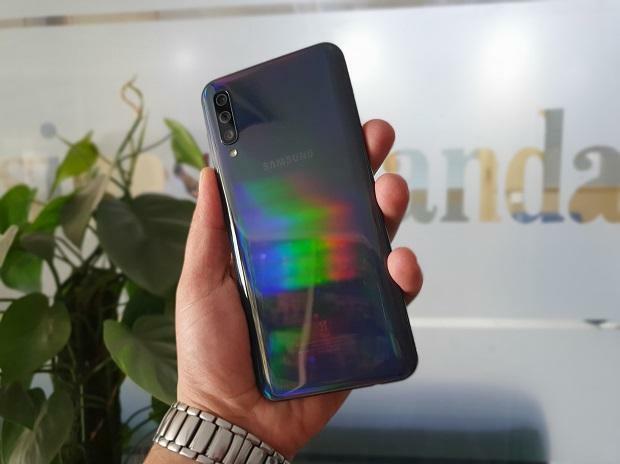 Premium or budget, gradient reflective design is an emerging trend in smartphone space and the Galaxy A50 showcases its colour reflective properties. The black colour unit I have reviewed has a greyish back panel that reflects rainbow-like colours with a tinge of blue predominantly covering the entire space. In reality, the black colour model does not show any black colour properties. Even the chassis looks blue in colour, making one wonder why the phone colour is marked as black? The phone has a slim profile with a power button and volume rocker keys on the right side, and dual SIM and microSD card slot on the left of the chassis. The top is left blank with a tiny opening for a secondary microphone. On the bottom, the phone has a 3.5mm audio port, USB type-C port for charging and transfers, primary microphone opening and five-hole speaker grille. The phone’s front is dominated by a screen with a U-shaped notch on the top, accommodating the front camera. The phone’s earpiece is located in a thin space above the notch and chassis. Though the phone has a thin bezel around the screen, it has a large one at the bottom – something common in most notch screen smartphones. The M-series received flak for using TFT screen in the Galaxy M20 (review) and Galaxy M10 (review). Thankfully, the A50 has a super AMOLED screen of fullHD+ resolution with a U-shaped notch on the top. The notch-based screen gives the phone almost bezel-less profile from the front. The super AMOLED screen looks vivid and has good sunlight legibility. AMOLED screens are known for their deep blacks and good contrast ratios and the screen on the Galaxy A50 is no different. The screen supports the always-on mode, which shows relevant information and notifications icons on the locked screen. The screen also boasts an in-display fingerprint scanner – an optical fingerprint recognition sensor under the display. This biometric module comes handy to unlock the phone. Though it is neither fast nor accurate, it does its job of unlocking the phone with the least effort. The Galaxy A50 has a triple camera module on the back, featuring a wide-angle primary lens, ultra-wide angle lens and a depth sensor combination. Of the three, it is only the primary wide-angle lens that supports autofocus. The ultra-wide angle shooter has a fixed focus lens with a wide field of view (FoV), making it a suitable choice for landscape shots. The depth sensor works only for live photos to add the Bokeh effect in the background. The camera supports the scene optimiser mode, which automatically detects scenes and adjusts settings best suited for the frame. However, it is slow and does not recognise even basic scenes such as food and pet at times. In terms of performance, the camera takes satisfactory shots in good light but is weak in low light. The primary lens works optimally in all light conditions, bright or low. However, the ultra-wide-angle lens takes good shots only in daylight conditions. Shots taken by the ultra-wide angle lens shows a fish-eye effect (curved distortion on the sides), which can be straightened using the built-in photo editing tool. In low-light, the camera fails to capture details. Yet, the overall output is on-par with most smartphones in the same segment. The front camera, on the other hand, delivers good results in all light conditions. It is best suited for selfies as the lens’ FoV is not wide, but standard. For an entry-level midrange smartphone, the Galaxy A50 has a decent performance, if not class leading. The phone comes pre-loaded with a lot of bloatware. Though it appears smooth in day-to-day operations, it shows some lags and inconsistencies when tested with processor and graphic-intensive tasks, such as recording long duration videos, and playing PUBG and Asphalt 9: Legends. The phone’s Android Pie operating system-based OneUI (user interface) is a welcome addition. Its native night mode (dark theme) support goes well with phone’s AMOLED screen. It is swift and intuitive, and works better in one hand than previous iteration of Samsung user interface – Experience UI. Powering the device is a 4,000 mAh battery, which is good enough to keep it going for almost a day. Charging time is also quick, thanks to supplied 15W fast charger; the phone takes around two hours to charge the battery from zero to 100 per cent. 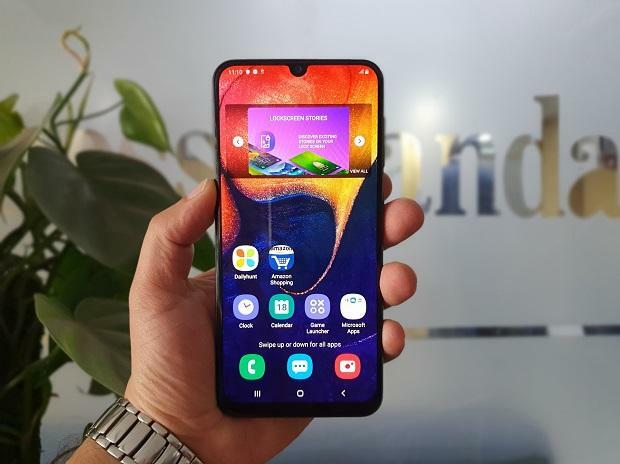 Priced at Rs 19,990 (4GB/64GB), the Samsung Galaxy A50 seems to be an identical twin of the Galaxy M30; albeit, with a gradient reflective design, sleek operating system, an in-display fingerprint sensor and a slightly powerful processor. At its price, the phone competes with the likes of Xiaomi Poco F1 and Honor Play.